Republican presidential candidate Ted Cruz applauded Sunday after Arden Jurskis and Kenzy Peach said that they were engaged. Whatever the term, Emerson College students Arden Jurskis and Kenzy Peach are doing it on the campaign trail at the Iowa caucuses — and they targeted a top Republican presidential candidate. 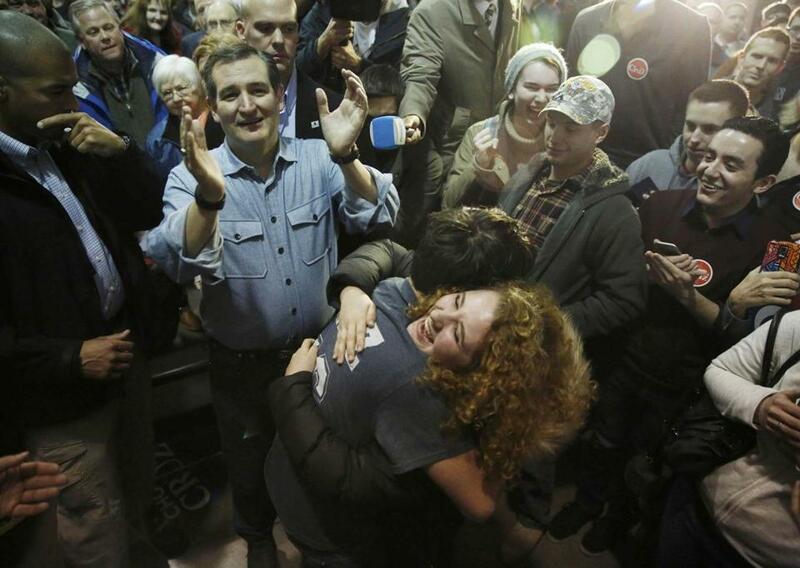 In a photo taken Sunday night during a rally for Ted Cruz in Des Moines, Jurskis and Peach are seen hugging enthusiastically. In the background, Cruz is standing, with his hands raised in the air, as if he were mid-clap. Just seconds earlier Jurskis and Peach “got engaged” in front of Cruz, who placed his hands on each of their shoulders while Jurskis was down on one knee appearing to pop the big question. The photo was widely shared on the Internet — and used by media outlets, including the Globe on Instagram. But there was no ring, and there isn’t going to be any wedding. The engagement was nothing more than a “brief demonstration of values and activism” to call out Cruz’s “hypocritical stance on marriage,” according to Peach. “It’s way more ethical to have two people of the same gender get married than have two college sophomores tie the knot,” said Peach. Peach and Jurskis are on a school trip to participate in the political process at the Iowa caucuses. Emerson College’s department of communication studies has been going to Iowa for every caucus since 1986. The school has been tracking some of the more serious student interactions with presidential candidates on Facebook. She pulled Jurskis aside, and told him to propose when Cruz got close. Jurskis said he leaned in to Cruz and asked the candidate to help him. The rest, as they say, is history — and it’s all over the Web. “He gave us the biggest hug I think I have ever received in my entire life,” said Jurskis. Peach admits that in hindsight she feels guilty for tricking Cruz. And they both said they would rather Cruz win the Republican race than the party’s front-runner, Donald Trump. “I’m OK with Cruz being the Republican guy, after meeting and seeing the rest of the candidates,” Jurskis said. The Cruz campaign didn’t immediately return an e-mail seeking comment. This wasn’t the first time while in Iowa that Jurskis pretended to be a fan of a Republican candidate. While Peach has been canvassing for Democratic presidential candidate Bernie Sanders, Jurskis has been hopping between the Republicans’ rallies taking selfies with presidential hopefuls. He has a photo of himself standing with Jeb Bush, the pair of them with beaming smiles. In a second photo, Jurskis is posing with Carly Fiorina. A third image, posted with the others to his Instagram account, shows Jurskis standing next to Marco Rubio. Jurskis said he’s making the most of his experience in Iowa, testing out his skills as a political commentator with a comedic twist. “My dream would be to host a political satire show on TV,” he said.